The 2012 Failed state Index is released the eighth edition of its annual Failed States Index (FSI), highlighting global political, economic and social pressures experienced by states. The 2012 FSI ranks the Horn of Africa dominates that of Somalia as number one for the fifth consecutive year, citing widespread lawlessness, ineffective government, terrorism, insurgency, crime, and well-publicized pirate attacks against foreign vessels, while Ethiopia stood at the 17 place scoring 97.7 worst than Eritrea that stood 23 with a score of 94.3. Kenya stood 16 with a score of 98.4. Ethiopia lost three places from last year. It is the worst while dealing with its demography at the same time India has more demographic trends scores 78 place with 78.1 points. So there is no reason why Ethiopia scored the worst in its ability to meet the challenges of Demographic Pressures only deference is democracy and development. Ethiopia is the second most populous nation in Africa and has one of the highest birth rates in the world, it constantly struggles to feed itself with its dictatorial leaders letting the most fertile land to be grabbed by the Indian and Saudi speculators while over 70 % three meals a day . Ethiopia would be first if the score is only based on the country that starves worst its population the last 50 years. Last but not list Ethiopia’s worst security apparatus that terrorize its own population and human right violations pushes here up on the index. Other notable changes this year include countries affected by the Arab Spring. 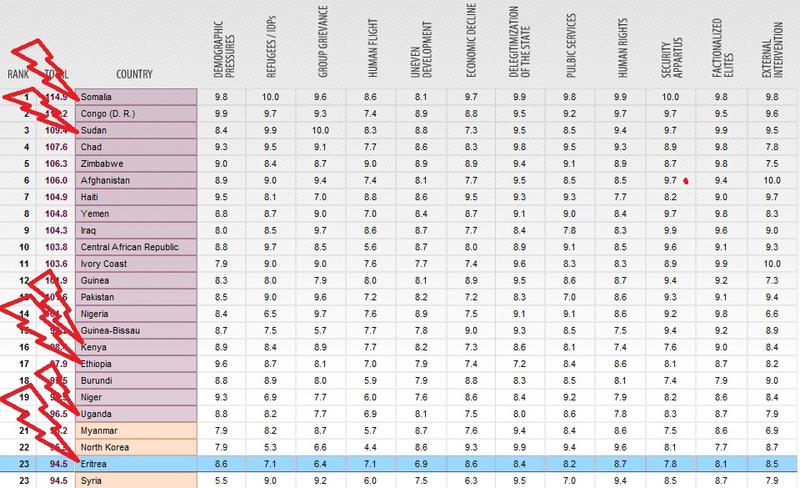 Bahrain, Egypt, Libya, Syria and Tunisia all ranked significantly worse than the previous year. Libya’s decline was the most remarkable, with the country registering the worst year-on-year worsening in the history of the FSI as a result of civil war, a NATO-led campaign of airstrikes and the toppling of the Kaddafi regime. Similarly, Syria registered the fourth-greatest year-on-year worsening in the history of the FSI as the campaign of violence by the Assad government took hold.